Russian manned spaceplane. Study 1957. 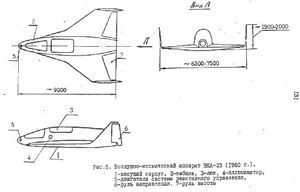 Following the very critical review of the first M-48 spaceplane design by the expert commission, Myasishchev went back to the drawing board. Status: Study 1957. Payload: 700 kg (1,540 lb). Gross mass: 3,600 kg (7,900 lb). Unfuelled mass: 3,000 kg (6,600 lb). Height: 9.00 m (29.50 ft). Span: 7.50 m (24.60 ft). In March to September 1960 this work resulted in definition of two alternative configurations. The first alternative was an unconventional faceted shock-wave riding design (see VKA-23 Design 1). 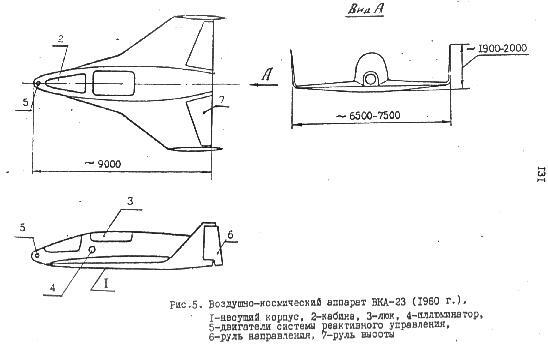 The second Myasishchev VKA-23 design was an elegant-looking, porpoise-fuselage winged vehicle, similar to Japan's HOPE design of forty years later. In comparison to the faceted first design, this version had a greater fuel load, much greater orbital maneuverability, and dispensed with the landing skis. Internal systems and construction materials were the same as Design 1. The spacecraft structure, build of steel and titanium, would have to endure sustained temperatures of 350 degrees C. The material selected to endure re-entry conditions could handle re-entry temperatures of 1,500 degrees C at peak heating load, cooling of 1,100 degrees C on landing. The thermal protection layer of the VKA consisted of tiles, composed of a silicium-graphite skin, within which were niobium alloy diaphragms injected with ceramic foam. The single-pilot spacecraft was sized for launch to orbit by Korolev's Vostok booster. The cosmonaut was provided with an encapsulated ejection seat system, with a mass of 160 kg and exterior dimensions of 0.8 m x 1.8 m. The seat would accelerate at 25 G, ejecting the pilot within 2 seconds after initiation through a hatch of 1.0 m diameter. Equipment (navigation and guidance, communications, life support, electrical, telemetry) was kept to 600 kg. Useful payload was 700 kg. Equipment developed for Korolev's Vostok spacecraft would be used in the VKA-23, including the Zarya communications system. The flight profile was as follows: to 11 km altitude the cosmonaut could use the ejection seat in the event of launch vehicle problems. Thereafter the VKA would separate from the booster. After a high angle of attack semi-ballistic re-entry, the vehicle would be maneuverable below 40 km. The pilot could eject from the spacecraft from the altitude of effectiveness of his parachute system: 3 to 8 km for the main chute, or 2 km for the reserve system. The second version of the VKA dispensed with the skid landing gear. The cosmonaut would eject from the VKA before landing and return separately to earth by parachute as in Vostok. In October 1960 Khrushchev's downsizing of the Soviet military-industrial complex and Kremlin intrigues led to Myasishchev's design bureau being dissolved. OKB-23 became Filial 1 of Chelomei's OKB-52 and all work on the VKA-23 was stopped. Myasishchev left to become head of TsAGI (Central Hydrodynamics Institute). 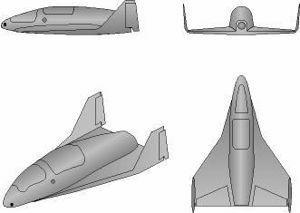 However the OKB-23 design team provided the experienced core for development of manned winged spacecraft by Chelomei under the Raketoplan project. Crew Size: 1. Spacecraft delta v: 540 m/s (1,770 ft/sec). Family: Spaceplane. Country: Russia. Launch Vehicles: R-7. Agency: Myasishchev bureau. Bibliography: 192, 81, 83.